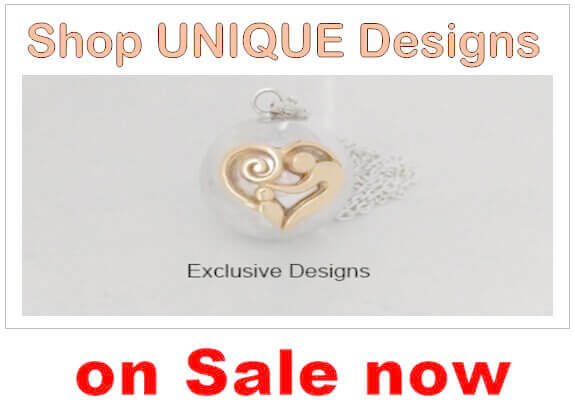 HarmonyBall.net.au, an Australian business, offers a range of over 200 Genuine Sterling Silver Harmony Ball Necklace designs. Our products are of the highest quality and every Genuine Sterling Silver Harmony Ball is handmade from the highest quality materials by Artisan Silversmiths in Bali, Indonesia. Our extensive selection includes many 'Exclusive Unique Designs' as well as our Traditional Balinese Harmony Ball Necklace range. Every Harmony Ball is checked before shipping to ensure it has a beautiful Harmonious Chime sound. All stock is held here in Australia offering speedy delivery. the internal Harmony Chime Ball on this Artisan Crafted exclusive design Harmony Necklace creates a beautiful soothing soft chiming sound with movement. Excellent VALUE: First and foremost all of our Harmony Necklace products are excellent Quality and represent excellent Value. 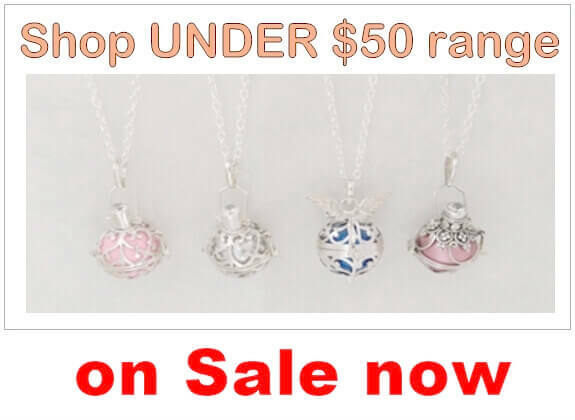 Largest range online: HarmonyBall.net.au, an Australian business with over 8 years experience online, is proud to offer the largest range of Harmony Ball Necklace and Harmony Necklaces in stock on the internet, or anywhere for that matter - over 200 individual models. We pride ourselves on forming strong relationships with our selected Silversmiths in Bali, Indonesia so that we can offer our customers excellent Quality, Variety and Affordability. Excellent Quality: Quality has been the key to our success since starting in 2011. All of our harmony necklaces are made from Genuine Sterling Silver & Genuine Gemstones whereas most other sites sell only 'silver plated or dipped' brass which look pretty in images however as most of us are aware the thin layer of plating will eventually wear off - and many of these sites are charging sterling silver prices for just silver plated!! 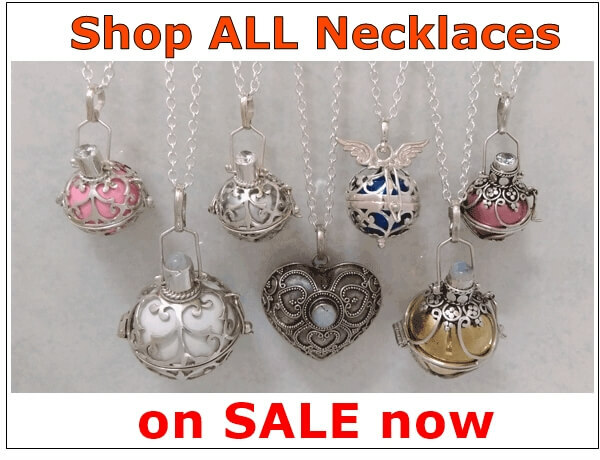 Largest Variety of Styles: We offer significantly more styles and designs than anyone else including many 'exclusive' designs - more choices for you to select from - hinged cage style all set with genuine gemstones, solid ball styles with ornate silver work, 'antiqued' sterling silver and more. Artisan Crafted: All of our Sterling Silver Harmony Necklace designs are hand made by Artisan Silversmiths in the Celuk region of the island of Bali, Indonesia, the 'home of harmony balls' where they are rooted in their culture which is evident in many of the traditional cultural Balinese designs we have on our site. We to travel Bali frequently to visit our silversmiths to check on quality control and build relationships that ensure we can continue to provide our customers the very best quality at the very best prices. Variety of Sizes: Harmony Ball sizes can vary with the typical size of a sterling silver harmony ball necklace pendant being about 3/4" diameter (18-20mm) with some being as small as 10mm (3/8") in diameter and they can be as large as 1 1/8" diameter (27mm). Most other sites simply offer one one size only - we believe in offering our customers 'choices', and the saying 'that one size does not fit all', so we offer a variety of sizes in addition to the largest variety of designs available. Informative Articles: Having spent a lot of time in Bali, Indonesia and learning from the local people, we pride ourselves in having expert knowledge of Harmony Balls and we provide a number of very useful and informative articles for our customers - one very good one is referenced below. In many cases the harmony necklace is passed on from mother to daughter and becomes a treasured family heirloom and hence it is important to buy quality.